"Only listen to the fortune cookie; disregard all other fortune telling units". 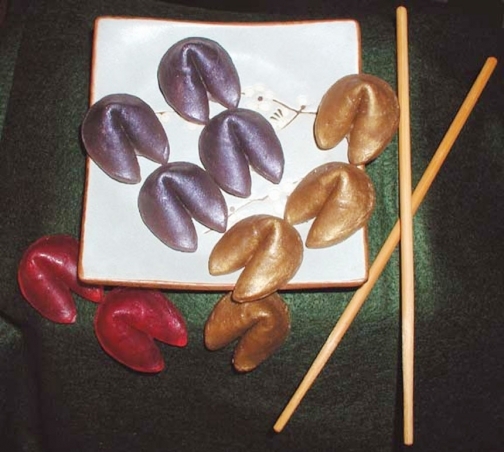 Fortune Cookie Soaps with Fortunes! You'll receive 5 solid handcrafted fortune cookie soaps with "general" fortunes (flat on one side) inside an oriental take out container. We are offering these fun, glycerin novelty soaps in bright see through colors or deeper colors using natural mica's. Scent: Green apple, Lavender or Citrus. These soaps are fun and make great gifts, guest soaps, or just for you. *Each soap weighs approximately .7 oz (soap is handmade - weight may vary). You will get a total of 3.5 ounces of soap. *Take-Out Container dimensions: 2 3/4" x 2 3/8" x 2 1/2" red, blue, green, purple, orange in solid colors. Please note that up for sale is only one set. Try our soap and you will notice the wonderful difference a pure Glycerin Soap brings to your skin. Soap base [Coconut Oil, Palm Oil, Castor Oil, Safflower Oil, Glycerin, Purified Water, Sorbitol (from berries, moisturizer), Sorbitan oleate (emulsifier), Soybean protein, Wheat Protein), Mica, skin safe fragrance oils. Item ships from: Warren, MI, US. $2.50 USD ($1.00 USD when combined with another item) by US postal service. $5.50 USD ($3.40 USD when combined with another item) by USPS. $2.50 USD ($1.00 USD when combined with another item) by USPS. Due to the nature of our products we do not give refunds and cannot accept products back for returns. If there is a problem with your order, please let us know as soon as possible so that we can work out a solution agreeable to all of us.